Storms - you can hear the thunder rumbling from far away, and you can see the dark clouds rolling in, swallowing up any blueness with thick and billowing variable shades of gray. Amazing! What's more - the rain. It pelts down streams, not droplets. The drains outside are enormous, but not big enough to cater for these types of extreme downpours. There were floods reported on Friday, not at Justine's, thank goodness. We took the kids to Justine's mum's place for a swim/paddle prior to the storm. Man, these two love the water. Kien hasn't really been swimming so he was apprehensive. But he enjoyed it for the most part. But 22 month old Sarah was not phased at all. She really loves to splash around in the water. Even when she slipped and went under she came up and was all smiles! The wind picked up and it was way too cold to be in the pool. I took a quick snap and we all dashed inside to put the kids under the warm shower. Kien had a reaction to the chlorine, and his eyes started really bothering him. We drove through peak hour traffic home - good thing traffic in Brisbane is not the same as Auckland. Twenty minutes later we were home, and 15 minutes later the antihistamine started kicking in. 30 minutes later Jessica was making him laugh. This coastal village is 15km from Brisbane CBD, and it was a perfect afternoon outing for us on Saturday (after the rain in the morning). We were going to let the kids loose in the water-park, but seeing as all other parents had the same idea we went to the playground instead. Kids love slides! I remember really loving slides when I was little. I guess it feels like a small roller coaster on the way down and the thrill makes you want more. There was a small children's playground not far away on the same strip, so we strolled over there. Kien saw the bouncy seesaw thing and wanted me to go on the other side. Good thing there was Jessica who wanted to go on it too. This is such an awesome playground. The view is fantastic. The facilities are mostly equally good. They had the metal slides, which actually don't slide. Sarah learnt about it the hard way. Check out the giant red patch on Sarah's forehead. It didn't stop her coming back for more though. This starfish sculpture is pretty cool. 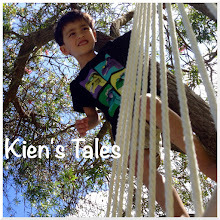 Kien was very careful getting up and standing on the uneven surface. Swings are always a hit. Little sister helped to push her big sister. Snack time was on the picnic table with what seemed like gail force winds ripping through the area. Kien lost his chips a number of times. Sarah and Kien were standing next to each other, and I asked them to both hold hands. Without even looking for her hand he reached out and went by touch. OK, one more pic just for good measure, because that's what a gushy mum does.